The AMAZING MAASAI GIRLS PROJECT (AMGP) is a volunteer-run US non-profit 501c3 organization. The AMGP was founded in August 2010 with the goal of providing high-school scholarships to academically gifted girls from Maasai tribes in central Kenya whose families would otherwise not have the means to fund their secondary education. OUR MISSION is to help adolescent Maasai girls avoid childhood marriage & motherhood, empowering them through education to find employment and independence as adults. We know that giving girls a secondary education not only improves the lives of the students and their families, but also of those in the wider community. 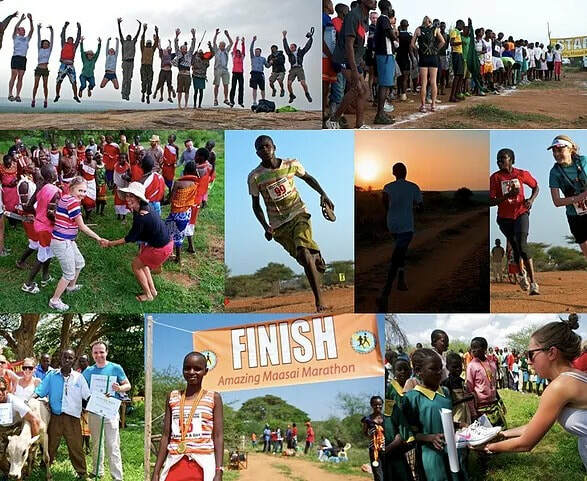 THE STORY SO FAR: More than US$400,000 has been raised in net revenue by AMGP since 2011, primarily through the international Amazing Maasai Marathon, our main fundraising event. You can learn more about the girls we sponsor here, or find out how to get involved here. ABOUT THE TEAM: ​We are a small group, working from the heart. The team consists of four active volunteers, based in the US, Thailand, and Kenya. HOW MUCH OF MY DONATION GOES TO THE GIRLS? : Because the Board of Directors is volunteer-run, we are able to keep administration costs to a mimimum - far lower than many similar charities. The details can be found in our annual donor reports on this page.